Calibration: The Samsung B650 was fairly calibration friendly without going into the service menu. There was a hitch at 40 ire but the TV performed well at 30 and 50 ire so this should not be an issue when viewing. The standard setting has a major blue push. The Movie setting allows adjustment of all picture setting options. Up conversion from 480i and 480p: One important note to always remember with this TV is to turn the 120Hz feature off when viewing anything but live sports programming. Doing so will save you the unpleasant kitchy cardboard cutout effect that this feature creates by taking the natural motion blur out of film based content. Finding the control to turn the feature off is not easy. See instructions below under Features section. Up conversion clarity is crisp and defined on the LN46B650. The picture is amazingly well defined without the excessive motion artifacts that can exist with many TVs when up converting from lower signals. There is a lot of range in the TVs ability to display lower end signals. This leads one to the conclusion that the B650 contains very high quality processing chip sets and indeed our HQV processing tests prove this to be the case. Black levels can get a little over saturated at times and there is a blue push with the panel in general which will cause the same effect when viewing programming occasionally. One drawback was continued judder effect (stuttering image) on side to side panning scenes. This is otherwise called motion lag and occurs more prominently but necessarily when turning off the 120Hz. 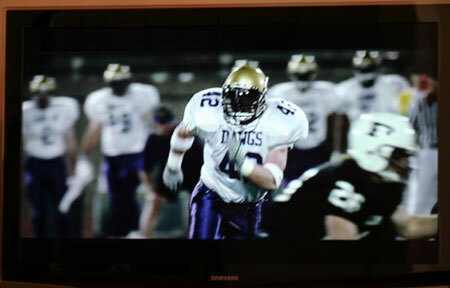 This shot from Friday Night Lights shows crisp detail from a 480i signal source. 720p/1080i/1080p Picture Quality: After turning off the 120Hz feature, high definition content appears vibrant, realistic and extremely crisp. Blacks are rich for an LCD and contrast is a strength. One of the highlight features of the LN46B650 is its picture depth perception. Samsung has been unparalled in this area lately. I believe this is due to the companies Ultra Clear Panel technology which does allow for some glare on the screen but the tradeoff with great depth and rich colors is a winner. 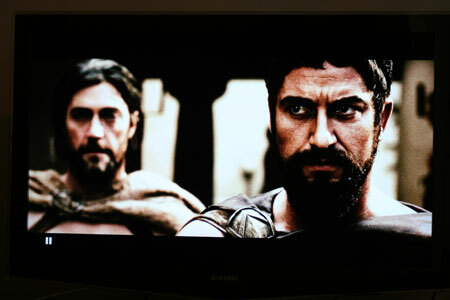 From the Blu Ray of 300 a sharp defined image. Black Level/Contrast/Contrast Ratio: Contrast ratio measures a respectable 959:1. 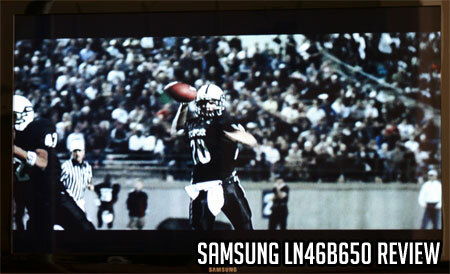 We believe contrast is enhanced by the Ultra Clear Panel that Samsung uses for this LCD. Blacks appear rich and there is no lack of brightness. 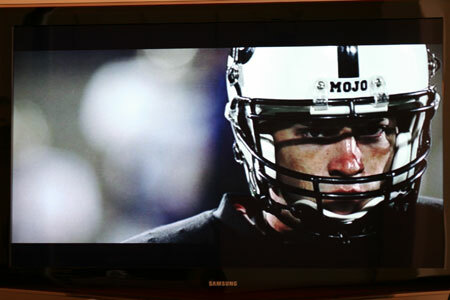 This image from Friday Night Lights shows excellent contrast, and shadow detail from the 480i DVD. Dark Shadow Detail: Blacks can over power dark material at times causing a little deficiency in shadow detail. It certainly is not what we could classify as a problem though. Color Rendition/Color Accuracy: Colors are bright, rich and vibrant but not oversaturated. The color rendition of this TV is exceptional. Viewing Angle/Off Axis Viewing: Off angle viewing is very good and the TV continues to display a deep image even at 45 degrees. Contrast and black levels do not degrade substantially at angles. Motion Lag: There is continued and prominent motion lag and judder effect especially after turning off the 120Hz Auto Motion Plus feature. Regardless of this, leave the feature on for sports programming but nothing else. A shot from Friday Night Lights. Motion lag and jerkiness is increased when turning off the 120Hz feature but this is still the best option with film. Live football would be another matter. 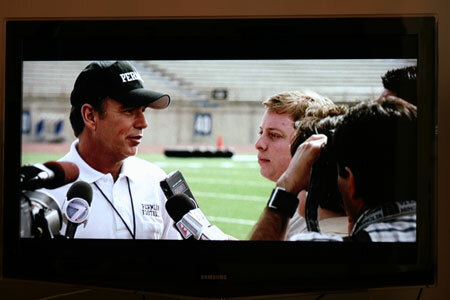 False Contouring/ Mapping: There was some false contouring and mapping present in a few scenes from Friday Night Lights. This did not appear to be a frequent problem and it did not occur during HQV testing. Next up the B650 LCD series has an Internet widget feature with Yahoo!, Flicker, You Tube, and others. It's one of those features that you will scroll through and glance at once and never use again. The options are currently unappealing, but it's nice to have the LAN connection for future proofing. The B650 series is DLNA compliant which allows various devices in the DLNA network to communicate with one another. Video Aspect Ratio Sizing: Aspect ratio processing and sizing was spot on non-distorted from a variety of input sources. Selection is 16:9, 4:3, Zoom 1, 2, 3. Aesthetic Considerations: The B650 has a unique design with a wide V shape and subtle ruby red Touch of Color graduating more pronounce near the bottom of the screen. The heavy, sturdy included table top stand has a clear neck and swivels side to side. Even the stand has the subtle graduated Touch of Color. Overall it's an interesting, pleasing design that gives an expensive air to the TV. Remote Control/Menu Functionality: The menu system on the on the LN52A850 has an excellent little tutorial which helps the user understand what each function does. It's a slick looking- transparent menu but the scrolling navigation wheel is not fast to use. It's a little cumbersome when you want to make a quick adjustment. Another negative here is the gloss black remote which shows fingerprints too readily. The source button controls input selection. The p. size button controls aspect ratio. Audio Output: Audio output was excellent from our Dolby Digital Test disc. Volume level was plentiful and sound rich and full at just 35% of capacity. Virtual Surround sound effects also impressed us from the 10W X 10W speakers. At $1450 this LCD is attractively priced especially for its picture quality. Competition comes from the LG 47LH50 which has Internet Netflix on Demand and 240Hz and sells for less at $1200. Another tough competitor is the Panasonic TC-P46G10 with a similar picture quality rating and priced at $1250. Other than that and Samsung's own plasma offerings, this Samsung will have about the best price in the market for price/quality consideration.